The beautiful lady sitting to my right in the photo above is my grandaunt, Jeanne Dietz Garrity. 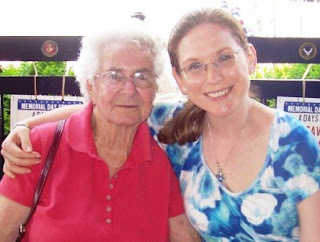 She was born in 1928, the oldest of three girls, and was my late grandmother Marilyn Dietz's older sister. An invaluable and enthusiastic source of family history, Aunt Jeanne (as I called her) not only provided names and dates for my great and my great-great grandparents; she elaborated on their lives in ways that brought them to life for me long after their passing. Earlier this month, Aunt Jeanne went to join them, her two sisters, and her beloved husband, after 84 years of life. She died on a Saturday. My husband and I had just taken advantage of Long Island Restaurant Week by having a spectacular three-course meal in Sayville. When we returned to the house, my mother met us in the kitchen with a sad face. "Is everything okay?" I asked. "No," she said. And then she told me. I feel fortunate to have called and spoken with Aunt Jeanne a few weeks prior. She'd sent me some family documents including her parents' marriage certificate, and upon review I'd noticed that my great grandparents had married in Hoboken, New Jersey. Why, I asked, had they married so far away from their family homes in Brooklyn? "Oh, they eloped!" she said. Apparently, they'd just found out that Jeanne was on her way. When I first told her what I'd found out about Mary Cordial, the great-great-great grandmother who'd sparked my genealogy habit, she was stunned. "I'm Irish?" she asked. She'd lived over 80 years without ever hearing this. "I had no idea Grandma Dietz was Irish. She always cooked German food!" When Aunt Jeanne spoke, there was something in the way she enunciated her words that reminded me of my grandmother's voice. It wasn't an accent so much as an intonation, accompanied by the occasional soft, whistling s. Her tone was calm, gentle. I felt a lot of comfort while listening to her. I'm so glad I was able to go to the family reunion that my first-cousin-once-removed, also named Jeanne, planned last May. Sitting in the screened-in porch with Aunt Jeanne, I was treated to numerous stories from her youth. The 1940 Census had only just been released the previous month and hadn't yet been indexed, but a researcher who knew the sought-after-family's actual street address might be in luck. "Where did you live in 1940?" I asked, in between tales. "With Grandpa Ernest," she replied, and she gave me the address. I found the family two days later, of course, right where she said they'd be. That day, she told me how happy she was that I was interested in learning about our family. "I love hearing your stories," I replied. "Anything you want to tell me, please do." She leaned forward in her chair then, grinning. "I love you," she announced. And we laughed. 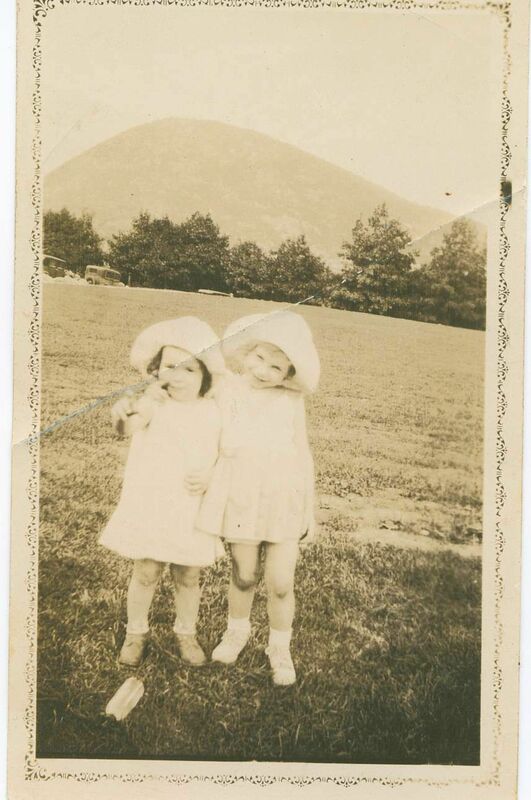 As children, Jeanne and Marilyn would walk with Ernest Ewald, their grandfather, to the Lutheran All Faiths Cemetery to plant flowers at the grave of his wife/their grandmother, Lizzie Burger. He survived her by fourteen years, and he felt the sting of her loss every day until he joined her. "Oh, my Lizzie," he would sometimes say aloud, when missing her became too much to bear. 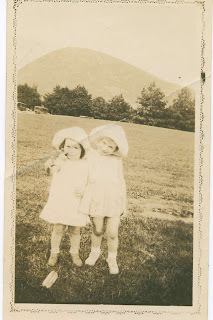 On Sundays, Jeanne and Marilyn went to the Presbyterian church for services in accordance with the wishes of their mother, Ruth. Walking home, they would pass their paternal grandparents' house. One Sunday, their paternal grandmother Jane Bullock Dietz came running out to ask where they'd been. When they told her, she insisted they come with her right away to Catholic mass, because their father Joseph was Catholic and that was where they should be going. Of course, they went right along with her. Jeanne also remembered being dropped off for babysitting at her Dietz grandparents' house one holiday season. Their Christmas tree was decorated and set up in a special stand that had been handmade by Louis Martin Dietz, the girls' grandfather. Having collected a number of wooden cigar boxes, Louis had repurposed them as components of a dollhouse with tiny hinged doors and shutters on the windows. Jeanne remembered crawling around on her hands and knees under the Christmas tree with Marilyn beside her, opening those little doors and windows, gleefully looking inside to see what might be within. She told me that one day when she and my grandmother were walking to school, a fellow student stopped and offered them a ride in his little blue convertible. He was sixteen and handsome, and although Marilyn didn't want to get in, Jeanne (then fourteen) insisted that they should. After they reached school, Jeanne hoped she might see Gilmore Garrity again later but decided she'd "never be that lucky." When dismissal time came, she went out the front door to find him there, waiting to drive her home. Later, when Gil was in the service, she went to his base to visit with him. While she made her way up the walkway toward the building where they were supposed to meet, she heard a sudden commotion--men shouting, angry--so she slowed down. Gil came flying out of the front doors then, pushing aside anyone in his way, and ran straight for her. He'd seen her coming and, unable to wait any longer to throw his arms around her, had plowed through the crowd without heed. She married him in 1946, and, like her Grandpa Ernest, survived him by fourteen years. When Aunt Jeanne and I last spoke on the phone, she was recovering after a recent hospital stay. She told me how nice everyone there had been, and how thrilled she was with the 54 Get Well cards* she'd received. She was weak, but determined. She noted, darkly, that she was the only one left of her generation, and spoke about how much she missed her parents, sisters and husband. Reminded of her children, grandchildren and great-grandchildren (seventeen of those, if my memory serves), she became cheerful again. She told me she loved me again, and that she needed to go and take a rest. I told her that I loved her, too. I am grateful to have known her, and I will miss her. Always. * Her daughter Jeanne told me today that the grand total was 84 Get Well cards, which I think is just perfect.